When Schneider goes looking for a new Operations Manager (OM), someone with determination, intelligence, compassion and passion are all on the top of the list of necessary characteristics. As it turns out, Jonathan Bass has all of those traits and then some! Jonathan assumed the role of OM at our busy Portland location on March 11, and when you hear a bit about his background, you’ll understand why he’s a perfect fit. Jonathan grew up in Idaho Falls, Idaho, and after high school he attended the Unites States Military Academy in West Point, N.Y. After graduation, Jonathan spent eight and a half years in the U.S. Army, much of the time serving as an armored reconnaissance officer. In that role, he was responsible for leading soldiers and developing strategies to collect information that would be used to improve the Army’s understanding of combat operations. During his time in the Army, Jonathan was stationed at Fort Carson, Colo. and Fort Riley, Kan. – and he was sent on four deployments to Afghanistan, Qatar, Jordan and central Europe (Poland and Germany). Because of his career in the Army, Jonathan and his wife had gotten used to moving often, but they now have three children under the age of 5, so they started weighing their options. Schneider works with a recruiting firm that specializes in finding jobs for junior military officers who are leaving the service – and that’s who first suggested Jonathan take a look at our company. After doing some research and being impressed by what he found – including that 22 percent of Schneider associates have military experience — Jonathan started the interview process. Jonathan was offered the role and accepted in October, and he followed a unique training schedule at Schneider’s Green Bay, Wis., headquarters, before moving to Portland in March. In addition, he attended the full DBL (Driver Business Leader) training, and has spent ample time at the Green Bay driver training center watching how Ryan Kimps’ team operates and shadowing Shoua Lee to get fully acclimated to Schneider and the intricacies of the transportation industry. Moving to Portland gets Jonathan and his family closer to extended family in Idaho, and it gets them closer to the mountains. In their spare time, the entire Bass clan loves to go camping, hiking and just being in the outdoors. They’re even hoping to get the kids on skis soon! “For me, making personal connections is the most important thing, so I’m looking forward to getting to know the DBLs and drivers in Portland – and putting some faces with the names. I know I’m joining a strong team with a great reputation, so I am really excited to get started." Looking to make your own career move? Follow Jonathan’s footsteps and explore Schneider’s values, military hiring record and career opportunities today. 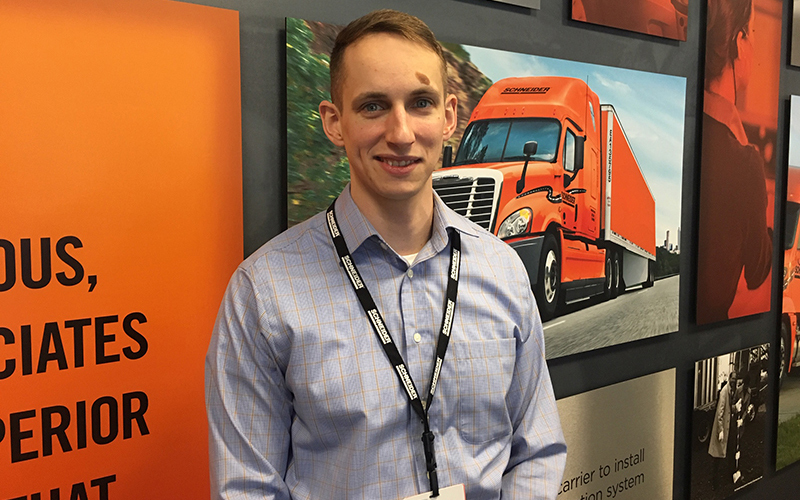 Do you have any questions about Schneider’s leadership training process, career opportunities or our Portland operations? Comment below.